A751 Version of "Spring" but marked A751 and listed in the pattern book as being in the "Georgian" shape. 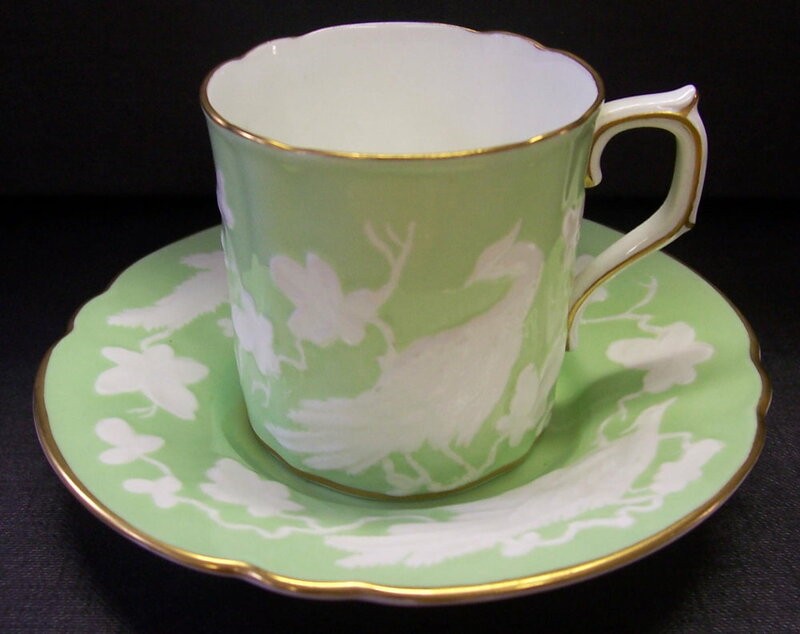 A752 – Coffee cup and saucer, the first example of the “Chinese Birds” shape and pattern as designed by Phillip Robinson when he joined the business in 1941. This version has a Duesbury green ground with the birds and leaves stencilled out. Shape Number 1970. (Applies to all tea and dinnerware). A753 – Version of “Spring” in the Ely shape with border in apple green. A754 - Version of “Spring” in the Ely shape with border in maroon. 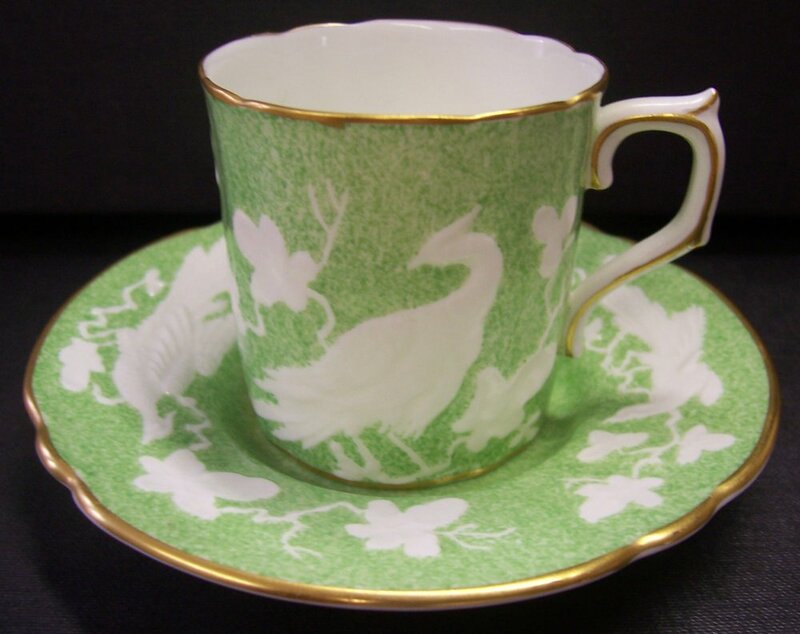 A755 – Chinese Birds coffee cup and saucer with a pea green ground. A756 – Fluted Chinese Birds dessert plate with a Golden Fawn ground. 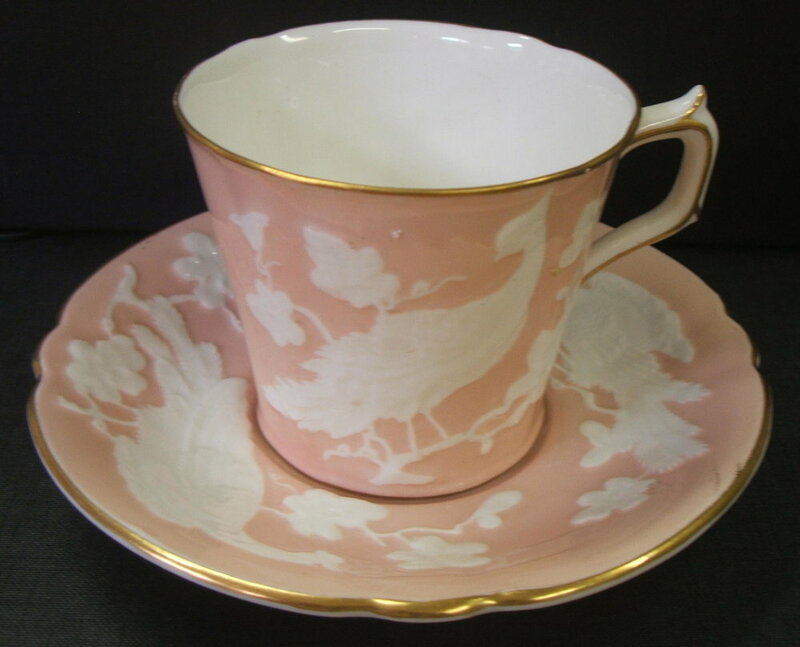 A758 - Chinese Birds tea cup and saucer with a Salmon ground. 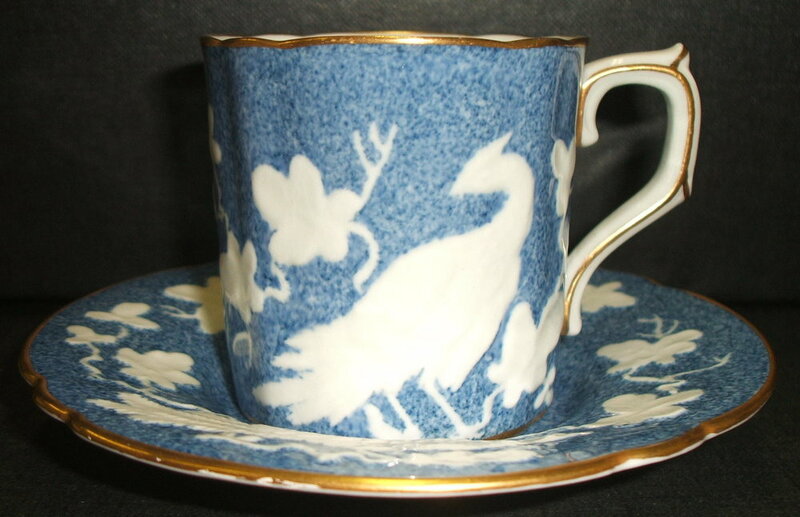 A759 - Chinese Birds coffee cup and saucer with a Celeste ground. 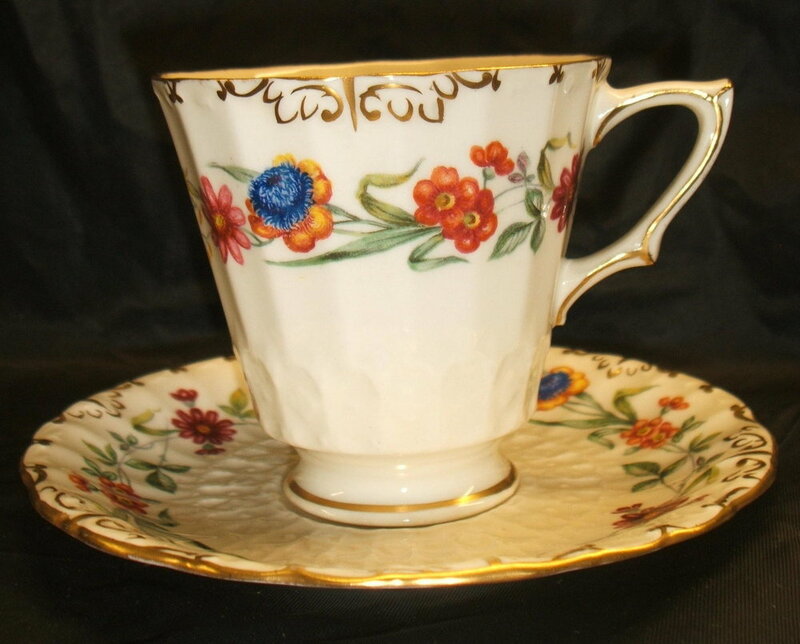 A761 – Chelsea shape cup and saucer with Rose du Barry band, ivory ground and posie sprays. A version of A616 Matlock which includes the ivory ground but with a pink instead of cobalt band. A766 - Fluted Chinese Birds dessert plate with a Yellow ground. A767 – The first example of the “Vine” shape and pattern as designed by Phillip Robinson. This very successful pattern remained in production in its various forms for over 35 years. The shape number for Tea and Dinnerware is 1967. There are fifteen different grounds listed in the pattern books and seven different centres (excluding plain), Other variants include whether the shoulder is scalloped (as shown for A767 above) or finished with a line and dentil, (See A768 above) and whether or not the ground extends over the embossed vine leaves or if they have been stencilled out and finished with an ivory ground. With so many potential variations it is not surprising that some pieces turn up which are not given specific pattern numbers. Others are not marked in accordance with the pattern books. Some of the ground colours look very similar at first glance and I keep a reference set. I have done my best! 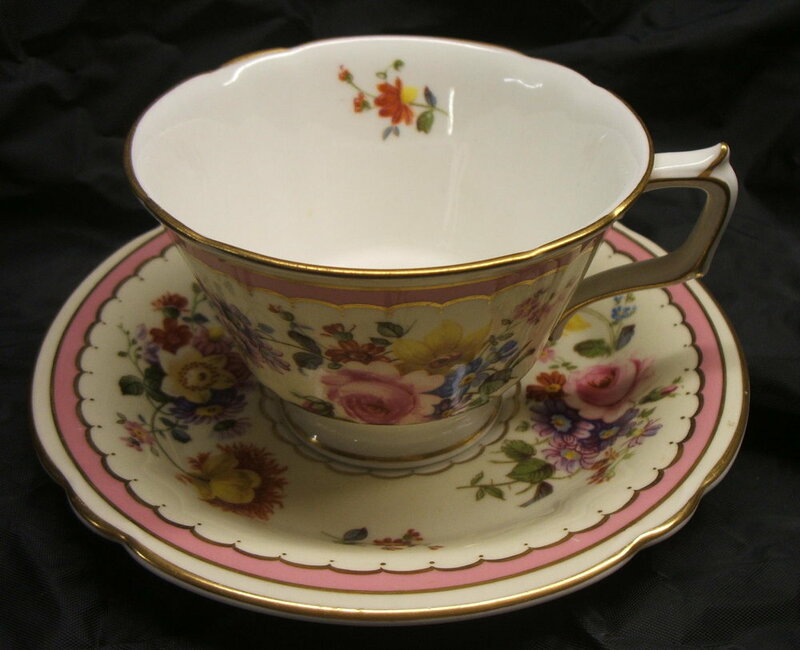 A767 – Demi-tasse cup and saucer with salmon ground. Vine leaves stencilled out and painted with ivory. A768 – As A767 but with two coats of maroon ground. A769 – Saucer as A767 but with two coats Rose du Barry ground. A770 – As A767 but with pea green ground. A771 - As A767 but with a Duesbury green ground. A772 – As 767 but with Golden Fawn ground. Here I have included a teacup and saucer, coffee pot, tea cream and sugar to demonstrate the different shapes. A773 – As A767 but with a celeste ground. A774 – As A767 but with celadon ground. A775 Vine White and Gold. 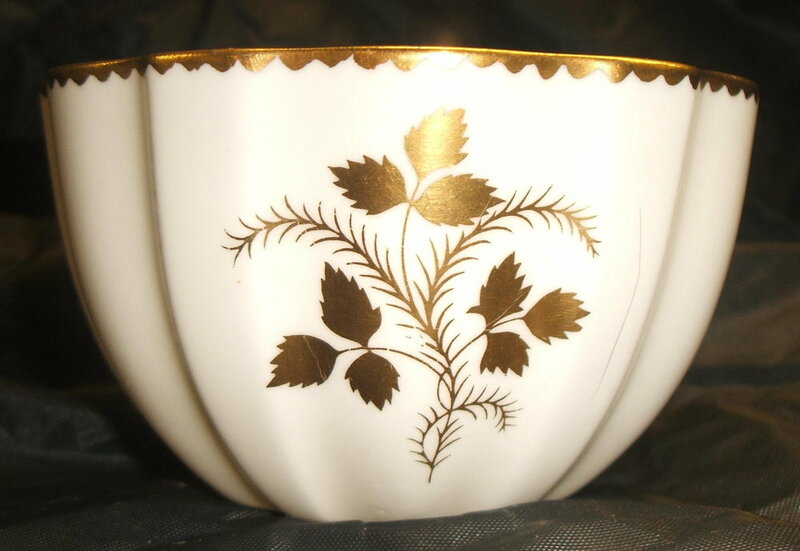 The simplest form of this pattern with no ground and no gilding to the centre of the saucer. I can find no pattern number for the example with the bird centre. A778 - Fluted Chinese Birds dessert plate with a celadon ground. A781 – The first example where the vine leaves have not been stencilled out. Pea green ground. A782 – as A781 but with a salmon ground. A783 - as A781 but with Duesbury green ground. A784 – as A781 but with a golden fawn ground. A785 as A781 but with a celeste ground. A786 – as A781 but with a celadon ground. 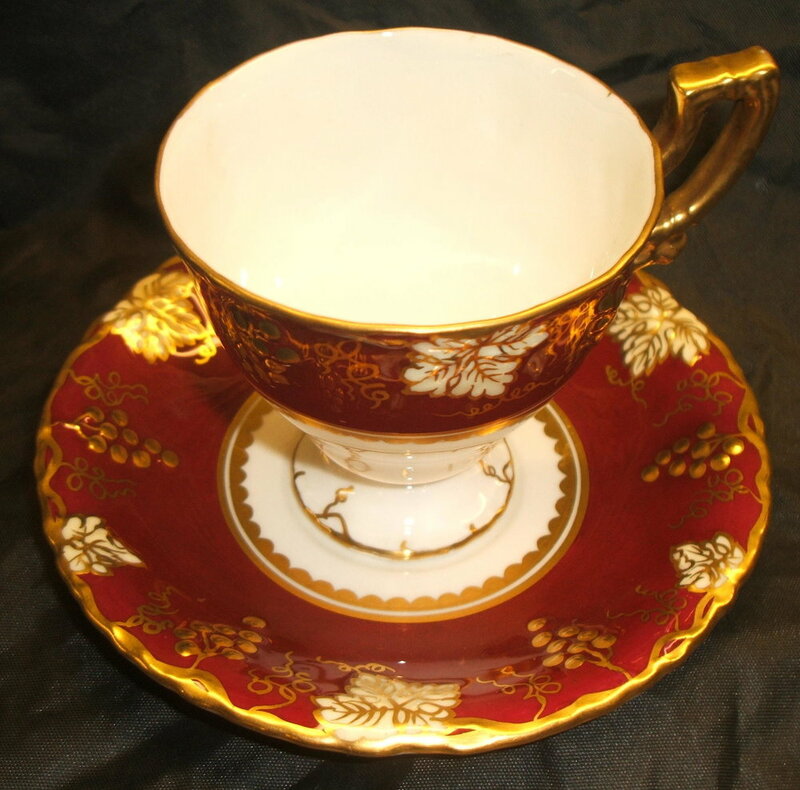 A787 – Elgin shape teacup and saucer with pattern printed in crimson underglaze. Enamelled with pale and dark blue, yellow green leaves and red flowers. A788 – The first example of the “Kendal” shape (Number 1969) and pattern, another designed by Phillip Robinson. This version has a celadon ground. A789 is A788 with a Duesbury green ground. A790 – A version of Kendal with a pea green ground. A791 – Kendal with a salmon ground. A792 – Kendal with a golden fawn ground. A793 - Kendal with a celeste ground. A794 – Ely shape plate with pattern printed in underglaze crimson. Coloured in pale and dark blue, red and yellow green. A795 – The first of a series of Chinese Birds/gadroon shape cigarette boxes and oblong ash trays, this version having a Duesbury green ground. Shape Number 1959. 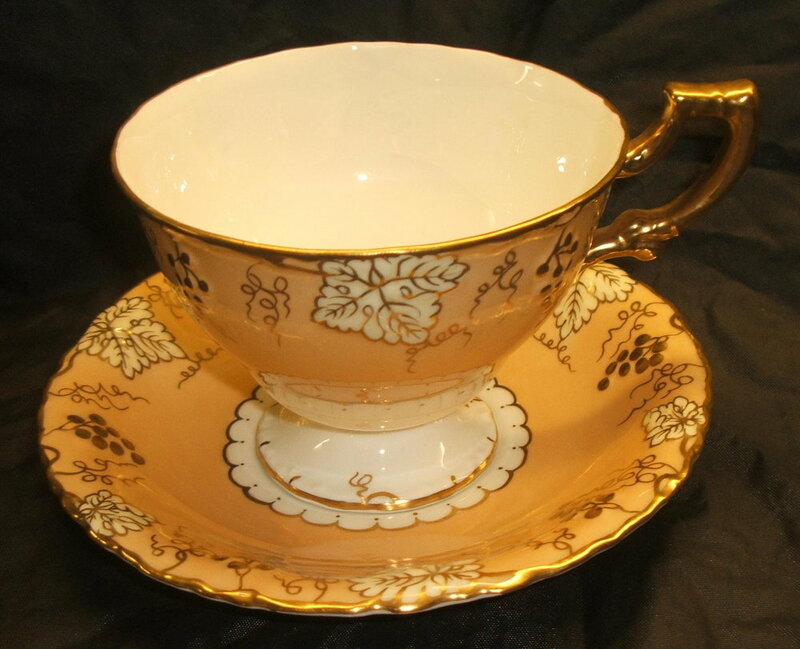 A798 – “Chatsworth” Coffee cup and saucer in the Burford shape. Pattern printed in sap green and coloured in yellow green, blue green and scarlet. I have also included a version in the Surrey shape. A802 – Uncommon Vine dessert plate with leaves painted in chrome green, the grapes in purple. A805 – As A795 but with pea green ground. A806 – as A795 but with celadon ground. A807, A808 and A809 – versions of A795 with celeste, salmon and golden fawn grounds. 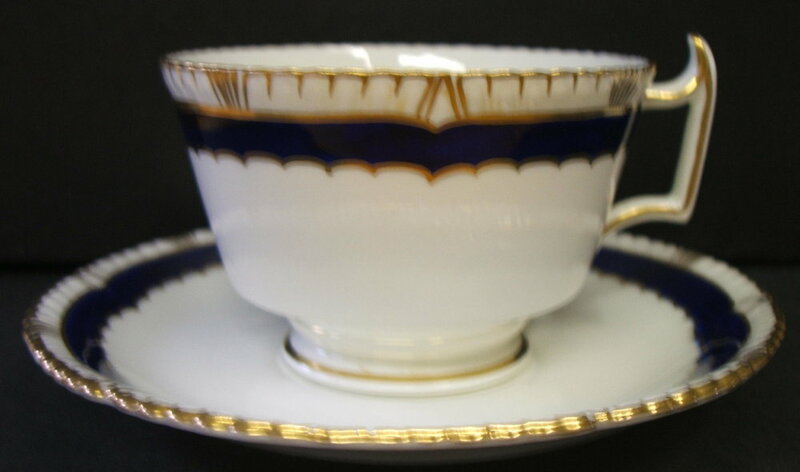 A810 – Vine teacup and saucer with cobalt ground, ivory leaves, and in this example, a line and dentil at the shoulder. A810 does seem to have been used to mark a number of pieces which clearly do not fit this criteria including those with different coloured grounds. 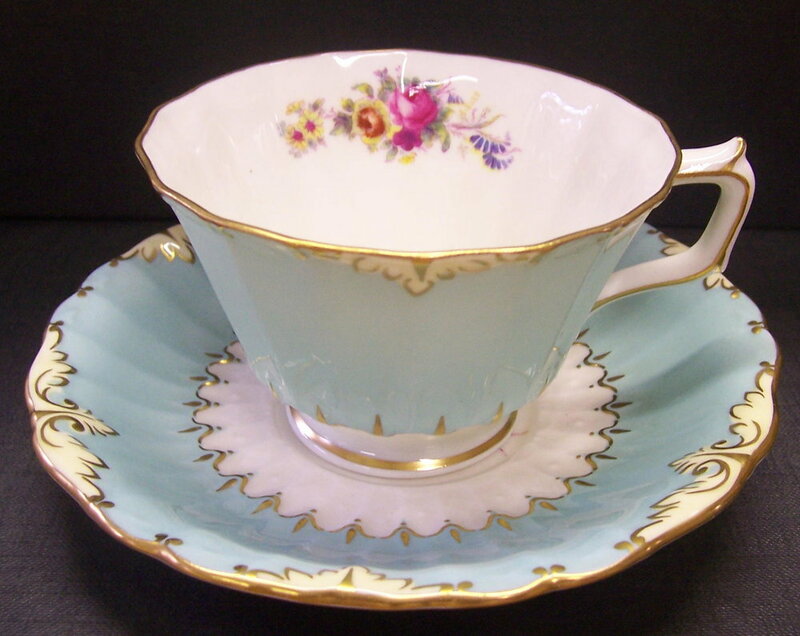 A812 – Vine teacup and saucer as A767 but with a heliotrope (lavender) ground. 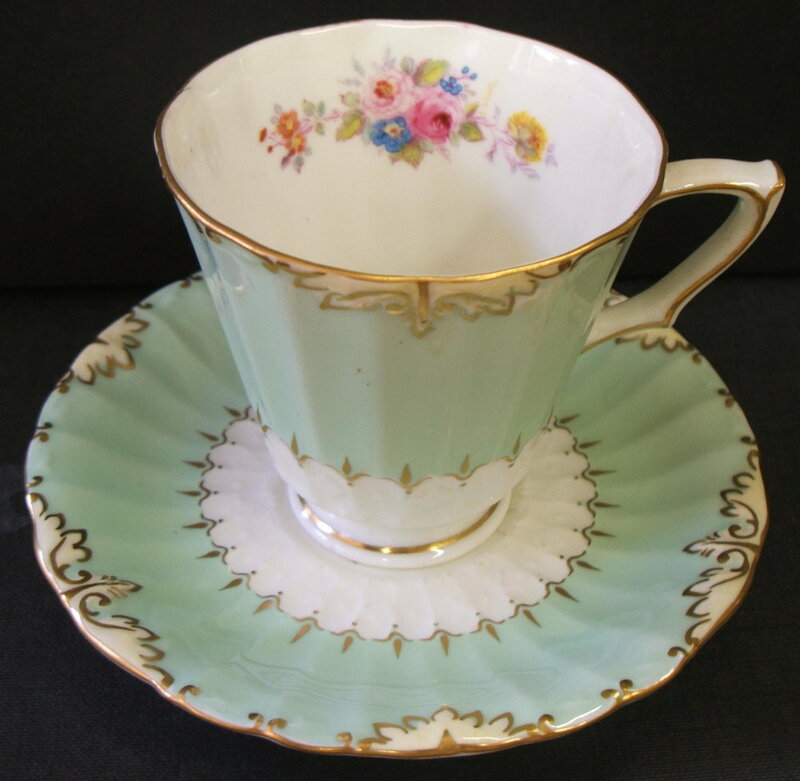 A814 Burford shape (Number 1968) demitasse cup and saucer in “Medway” – The pattern is printed in emerald green and painted in yellow and dover green with blue flowers. I also show a matching coffee pot, sugar box and tea cream together with a dinner plate with an "Ellis" centre. A popular pattern it was also produced in the Ely, Surrey and Gadroon shapes. I also include a Surrey shape plate with a posie centre. A815 – Plate in the Burford shape with salmon ground and ivory on embossment. Flower centre printed in purple and painted by “Ellis”. A816 – Talbot shape plate with celadon ground. Rose centre printed underglaze in blue and then enamelled in blue. Gilt edge and centre. 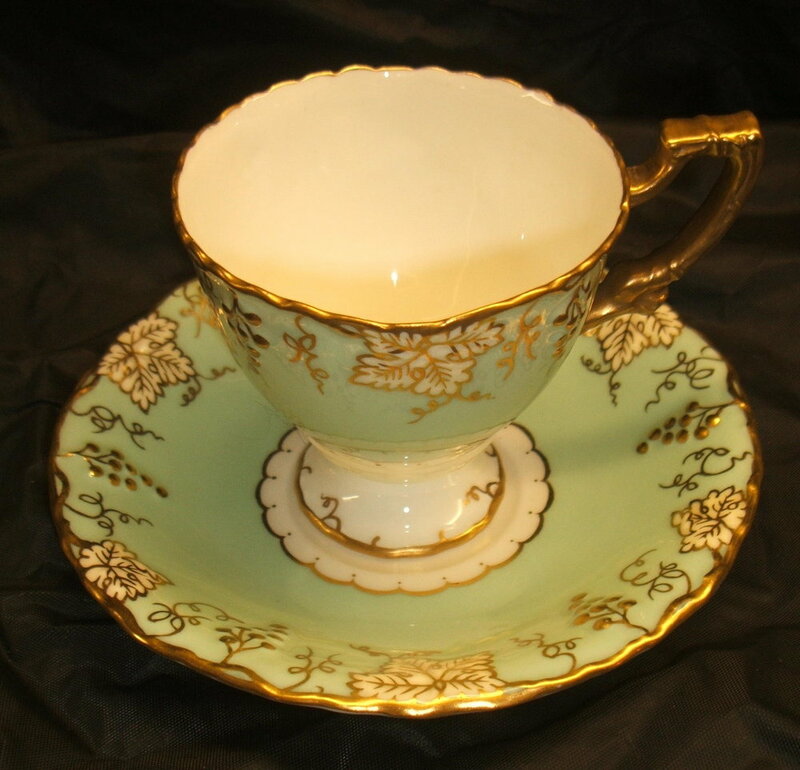 A819 – Burford shape teacup and saucer with celadon ground and ivory on embossment. Flower centre printed in purple and painted by “E Ellis”. (Celadon version of A815). A820 – Heliotrope version of A815. A823 – Version of A815 but with a Duesbury green ground. A824 – Pea green version of A815. A825 - Golden Fawn version of A815. A827 – Vine Dessert plate with golden fawn ground ivory leaves and Garnett centre. The image above is labelled a variant as it lacks the ivory leaves but otherwise meets the description. A828 – Two Vine dessert plates with salmon ground, ivory leaves and Garnett centres. I have included both to show that the hand applied decoration means that every plate is slightly different. A829 – Vine dessert with pea green ground, ivory leaves and Garnett centre. 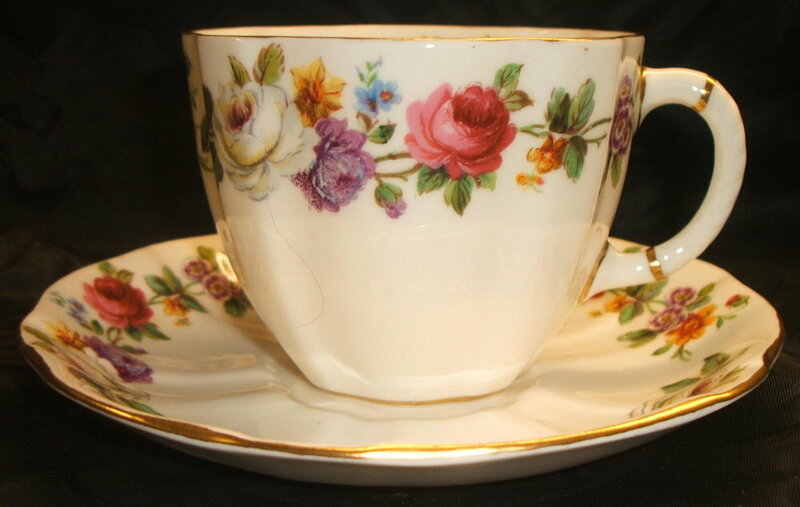 A832 – Teacup and saucer in the Tavistock and Talbot shape. Powder blue underglaze ground to rim depth with posie centre. A833 – As A832 but powdered apple green. 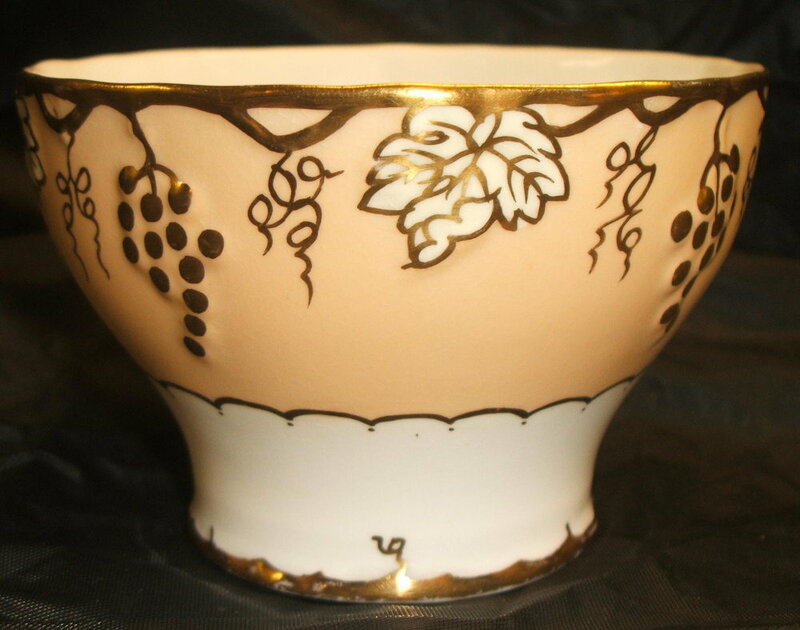 Variant also shown with a golden fawn ground unlisted in pattern book. 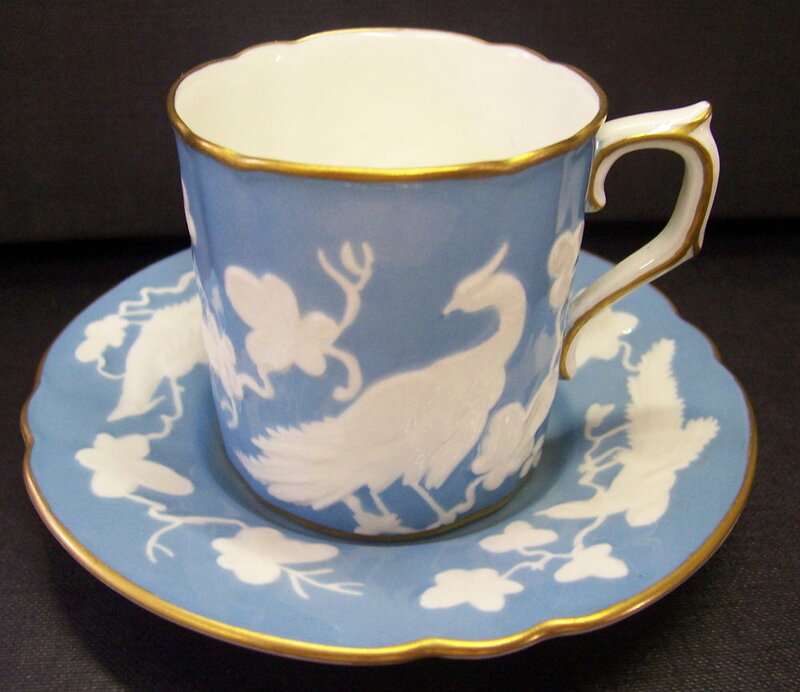 A834 – Chinese Birds Coffee Cup and Saucer with underglaze powder blue ground. A835 – As A834 but with powdered maroon ground. A837 – As A834 above but with powdered apple green ground. A838 – Vine dessert plate with celadon ground, ivory leaves and Garnett litho centre. Line and dentil at shoulder. A843 Variant – The first example of the “Pershore” shape and pattern, another design by Phillip Robinson. The pattern book lists a dessert plate with yellow ground all over and with the whole embossment stencilled out and left white. Gold edge. The two plates shown above lack the yellow ground and have a posie centre. Shape Number 1971. A844 – As A843 but with a Duesbury green ground. A848 - Pershore with celeste ground. 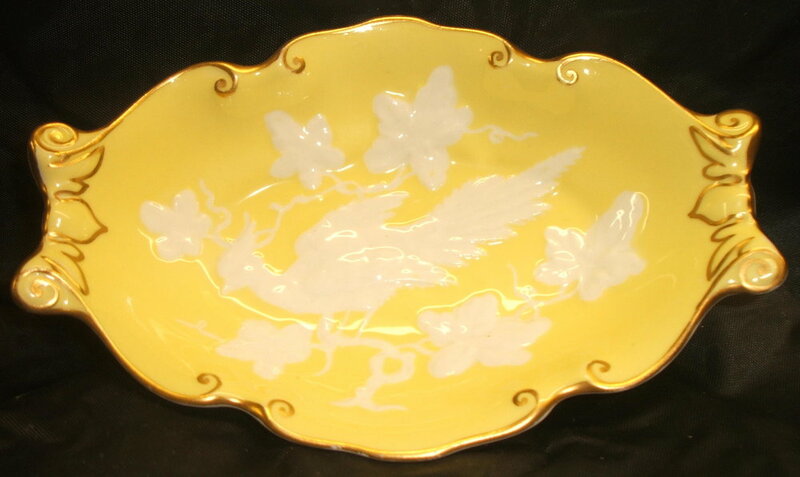 A861 – Leaf tray in the 1957 shape with yellow ground all over – best gold edge. A861 Variant – As A861 but no ground. A further version with a posie centre. A863 – As A861 with celadon ground. A868 – Vine dessert with Montreal green ground, ivory leaves and Garnett centre. Line and dentil at shoulder. 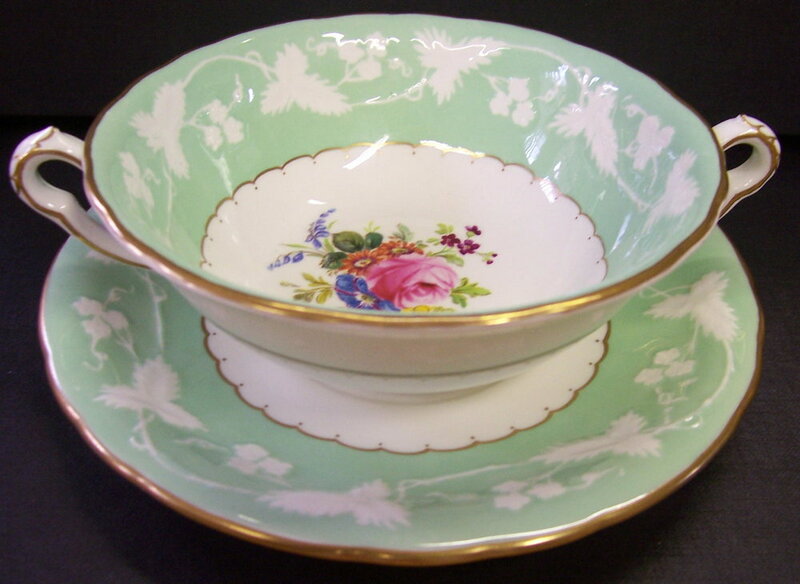 A869 – Kendal shape cup and saucer with celadon ground, and Garnett centre. A870 Kendal shape soup and stand with Duesbury green ground and Garnett centre. A872 – Kendal shape plate with salmon ground and Garnett centre. A873 – Kendal shape saucer with yellow ground and Garnett centre. A874 – Kendal shape plate with a celeste ground. The pattern book lists a Garnett centre, whereas the plate above has a Dean centre (Monsal Dale). A875 Listed under A875 but there is a blank entry in the pattern book. Kendal shape soup and stand with no ground and a posie centre. I also include a dinner plate with a Garnett centre. A876 – Ely shape saucer with ivory ground, posie sprays and a yellow ground band. 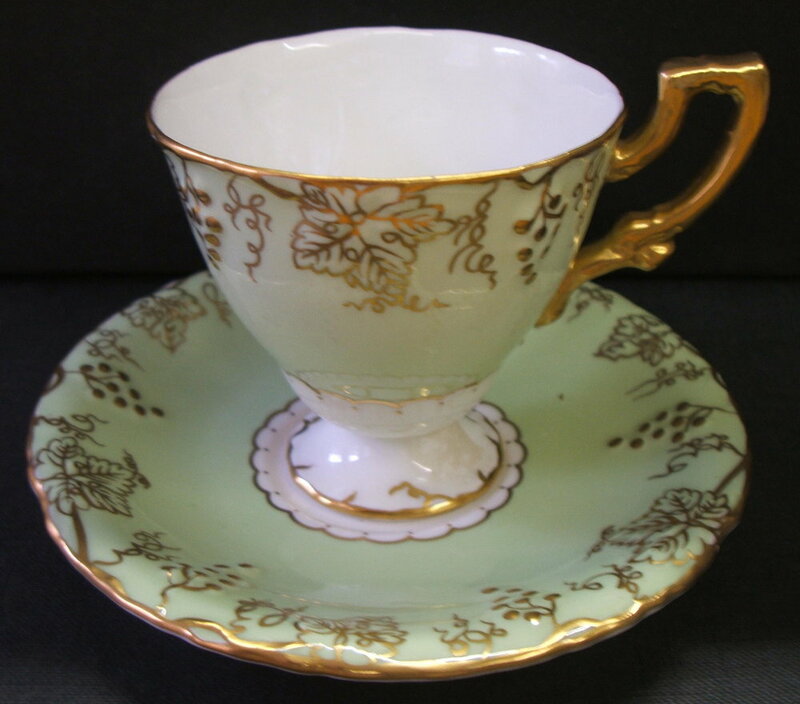 A878 – A silver shape cup and saucer with celadon ground but no centre. A version of A277 without a centre decoration. A878 – A yellow version of A277 but with no centre decoration. A879 – A version of A775 Vine white and gold with Garnett centre. A880 - Not shown - A duplicate of A876 ("Matlock" with a yellow band). This pattern appears to have been double entered in the pattern book by error. 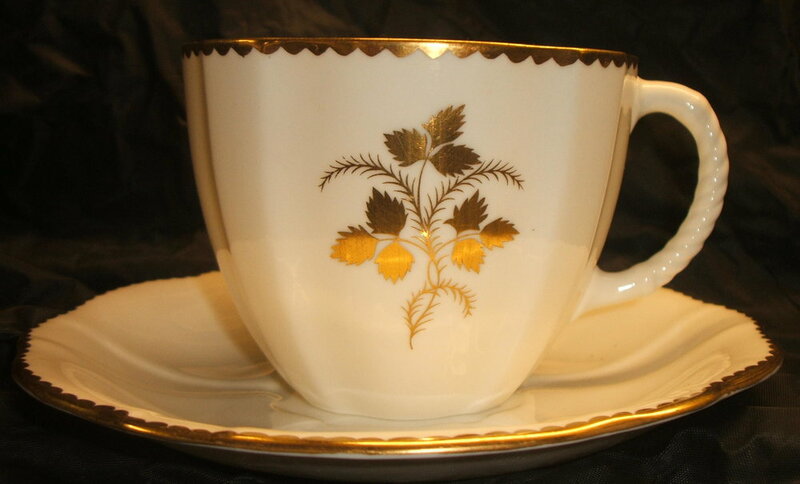 A882 – Vine demitasse cup and saucer with yellow ground and no ivory leaves. 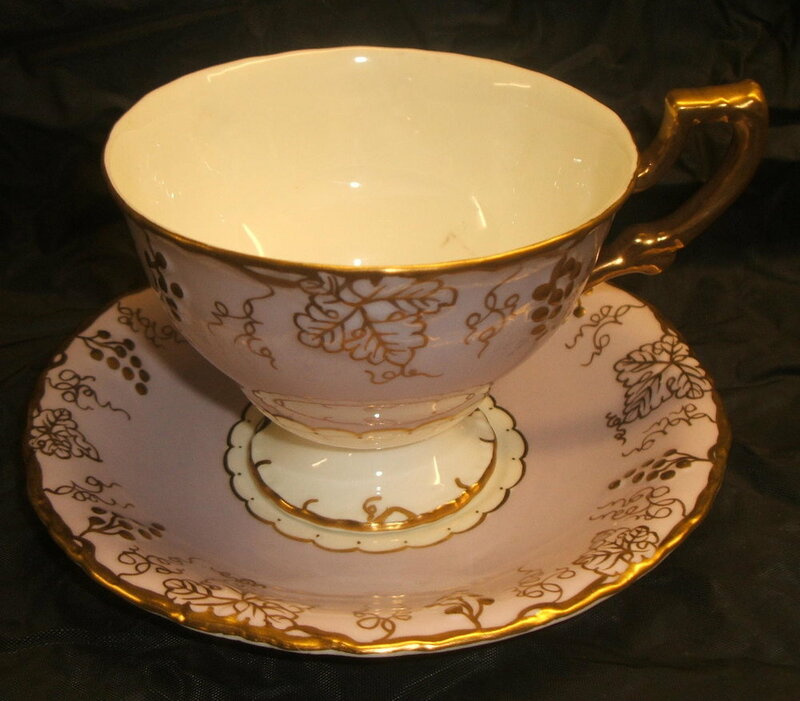 A883 – Vine teacup and saucer with heliotrope ground and no ivory leaves. A889 – Pershore shape oblong tray with salmon ground stencilled out to leave front embossing. “Edge embossing hand gilt by men”. Shape Number 1963. 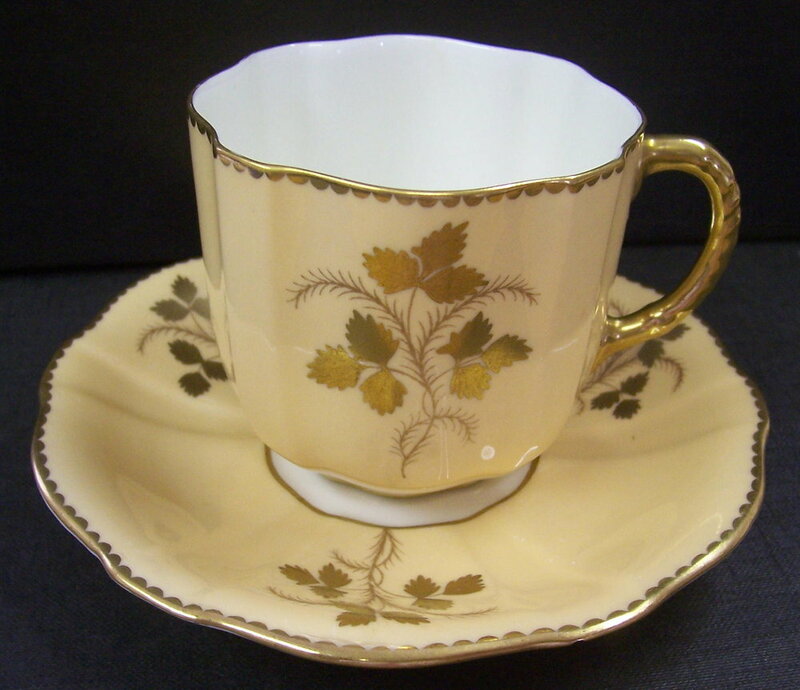 A890 – A Pershore shape cup and saucer. As A889 but with celadon ground. A891 – As A889 but with Duesbury green ground. A895 – The first of a series of Chinese Birds trays in four different shapes – Tray No 1959 (the plain version is number 913), Plain Rockingham No 1960, No 1961 Plain Leaf and No 1962 (Silver no 1). The tray shown is No 1961 plain leaf with a Dewsbury green ground. A897 – As A895 but with salmon ground in the 1960 Rockingham shape. A898 – Celadon version in the No 1962 Silver No 1 shape. A899 – Celeste ground in the tray No 1959 shape. A900 – Yellow ground in the No 1962 Silver No 1 shape. A903 – Grey ground in the 1960 Rockingham shape. A910 – Burford shape plate with blue printed “Daisy sheet” pattern and Ellis centre. Edge and verge embossing traced. A908 (not shown) is this plate without the Ellis centre. A921 - Described in the pattern book as being Dean centres on the Vine shape with celadon ground and ivory to the rim, the two plates shown above fit the description exactly with the exception that both centres are signed by the decorations Manager John Price. A922 – As A775 Vine White and Gold, but with the addition of an Ellis spray. I have also included a version with a different centre. A925 Gadroon shape plate with maroon ground to rim, embossing left white. Raised spot border below edge with hand gilt pattern below spots. Gold scalloping at shoulder. Gadroon edge traced. Posie centre. A929 – Soup and stand. As A775 Vine White and Gold, but with the addition of a posie spray. A934 – Vine dessert plate with celadon ground to below shoulder. No ivory leaves. Gold line around Dean landscape centre, “Ilam Rock” in this instance. 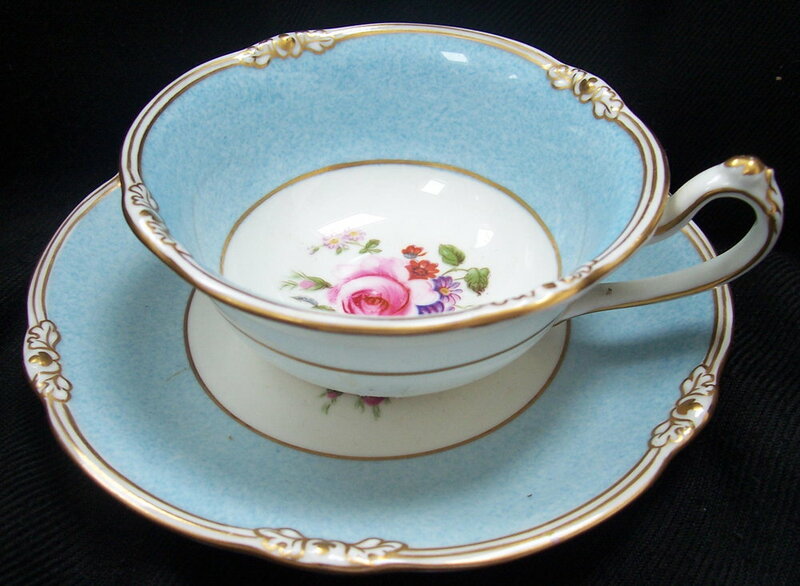 A936 Variant – Burford shape teacup and saucer. The pattern book lists an ivory ground with Garnett centre, but this version has a maroon ground. Gold traced embossment. 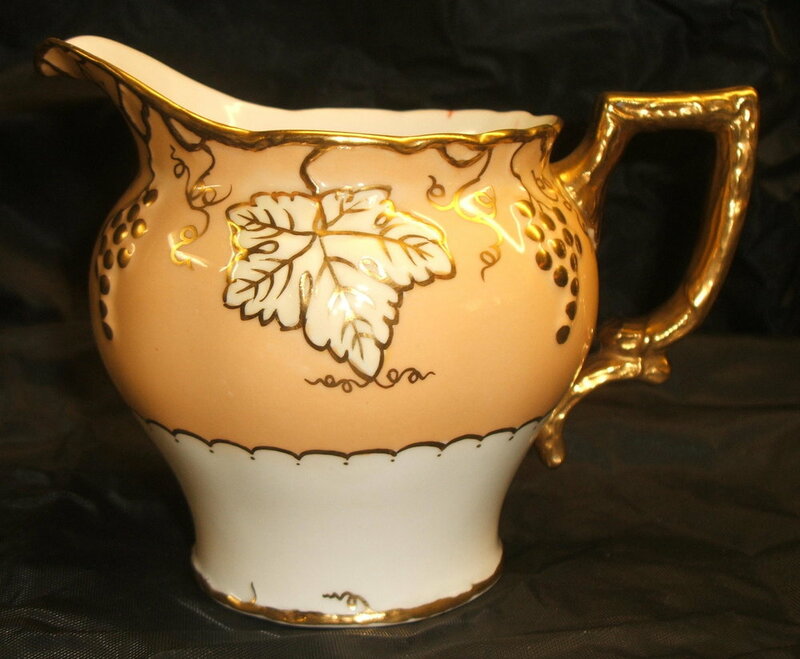 A937 – Vine comport with maroon ground to rim and ivory leaves. Garnett centre. Line and dentil to shoulder. 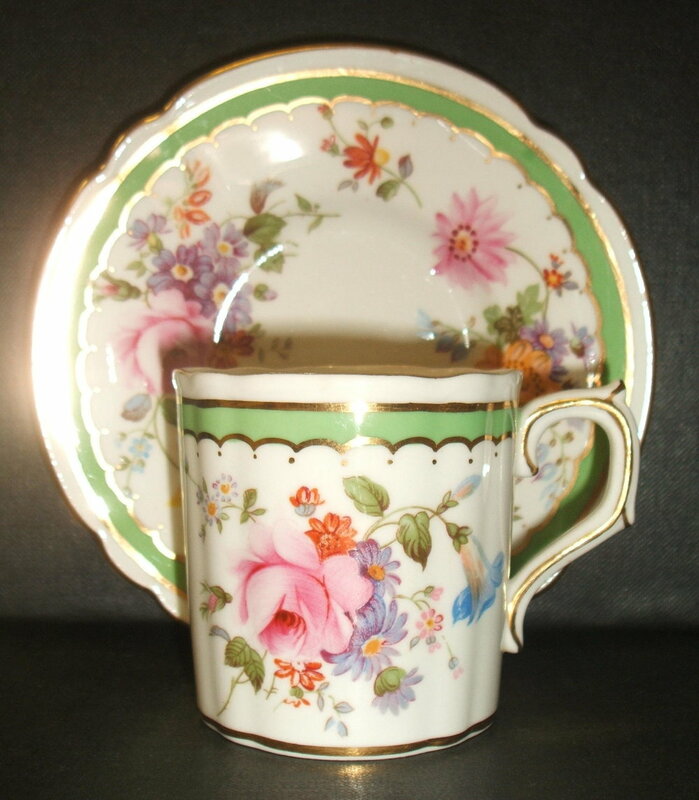 A940 – Chelsea shape coffee cup and saucer, sugar, cream and coffee pot. As A616 Matlock with posie sprays, but no ivory ground and green ground band. 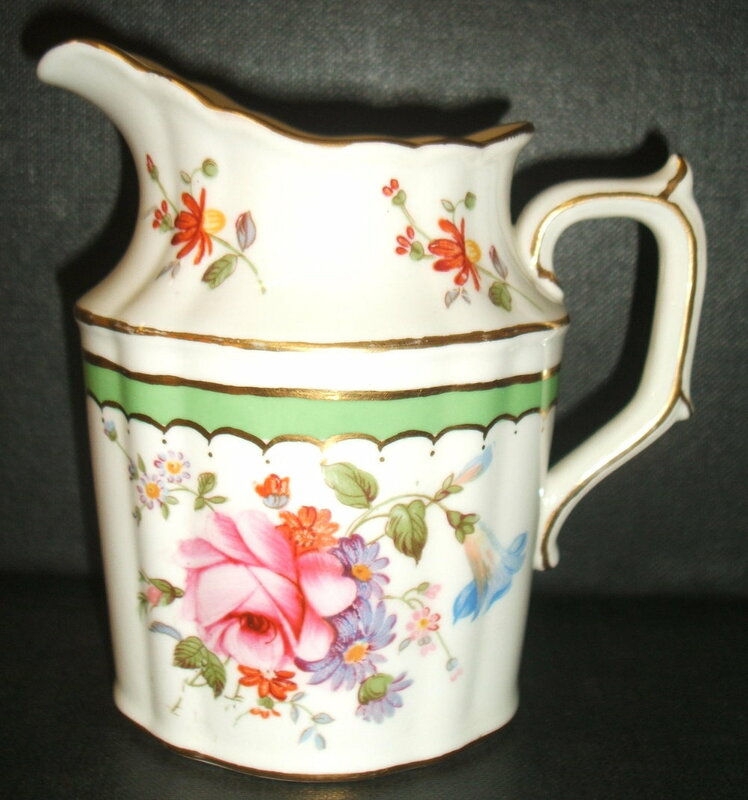 A941 “Wentworth” in the Surrey shape.- Here shown as a Milk Jug together with a Swansea shape sugar and cream. A943 – Surrey Teaware as A941 but with the addition of a salmon ground on the outside of the cup. The centre of the saucer is left white. A945 “Ashby”. Burford shape soup and stand with litho posie centre. Rose painted and embossment traced in gold. 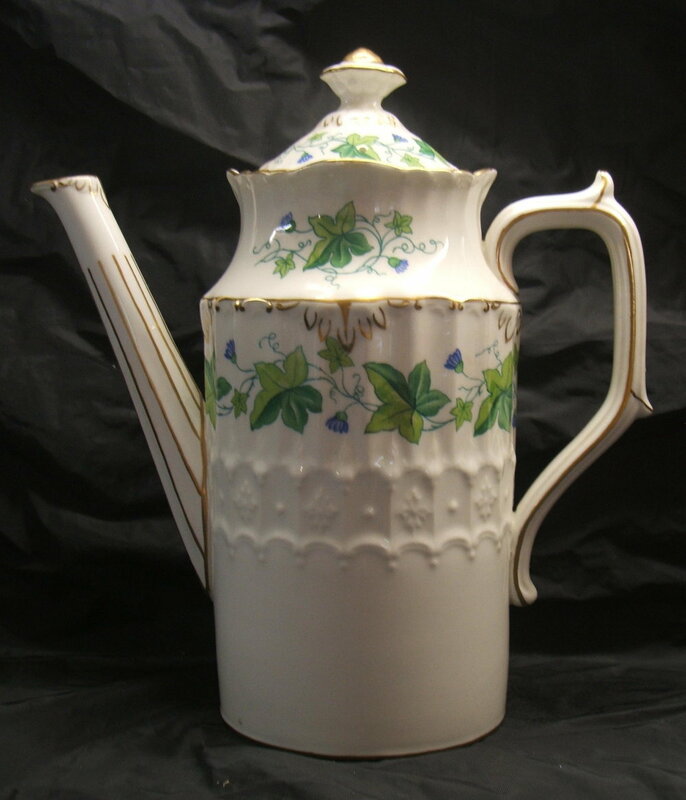 A946 – “Princess” – Chelsea shape teaware presented to Princess Elizabeth on the 20th November 1947 by Derby Corporation on the occasion of her marriage to Lt. Philip Mountbatten. An old revived pattern which is helpful because it provides a date reference in the pattern list. A1370 is a green version of this pattern. A947 - All gold printed pattern in the Chelsea/Ely shape. The pattern is filled in by hand. Gold edge. A951 - Maroon ground, gadroon shape. Described as "A924 only no raised spot". Also shown is a variant with a posie centre. A952 – As 941 “Wentworth” but with the addition of a golden fawn ground. This example has a gold footline and centre. A956 – Gadroon shape soup and stand with maroon ground band. 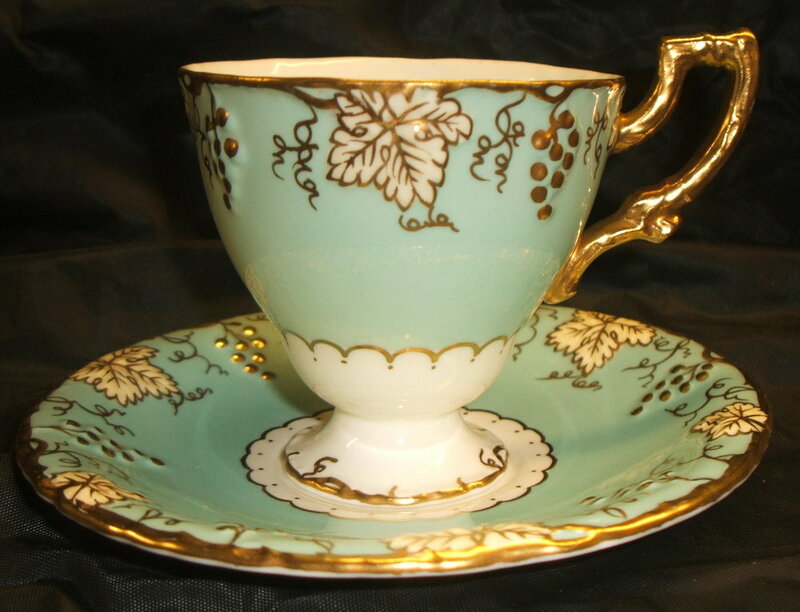 Alongside is a teacup and saucer in the cobalt version. A968 (see below) is the green band version. A957 – Vine as A775 White and Gold but with addition of an ivory ground to the rim. Here shown with a Garnett centre. A968 – Gadroon shape with litho posie sprays. Edge embossment slightly traced. A959 – Burford shape as “Ashby” A945, but without a centre. 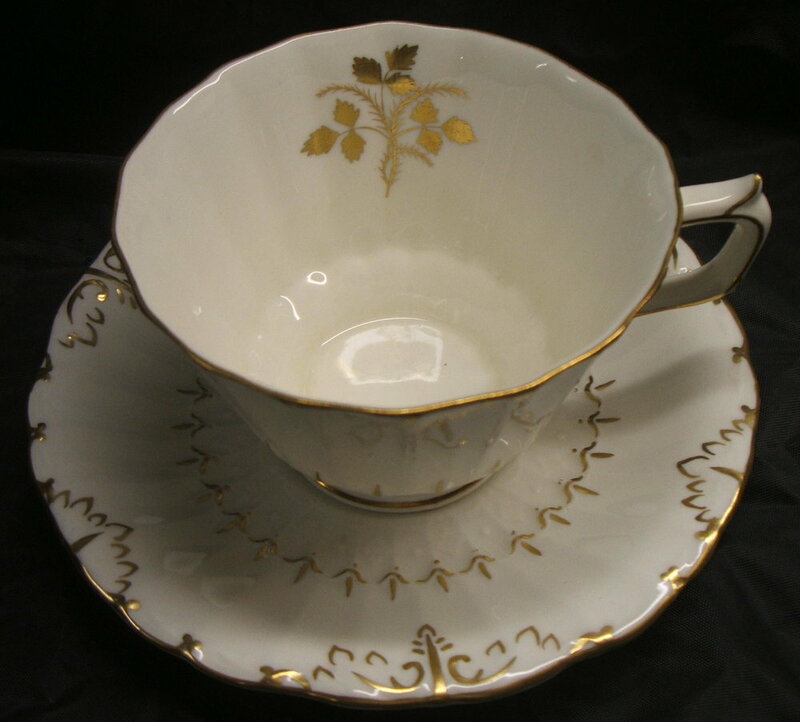 A962 – Queen’s Gadroon shape teacup and saucer. 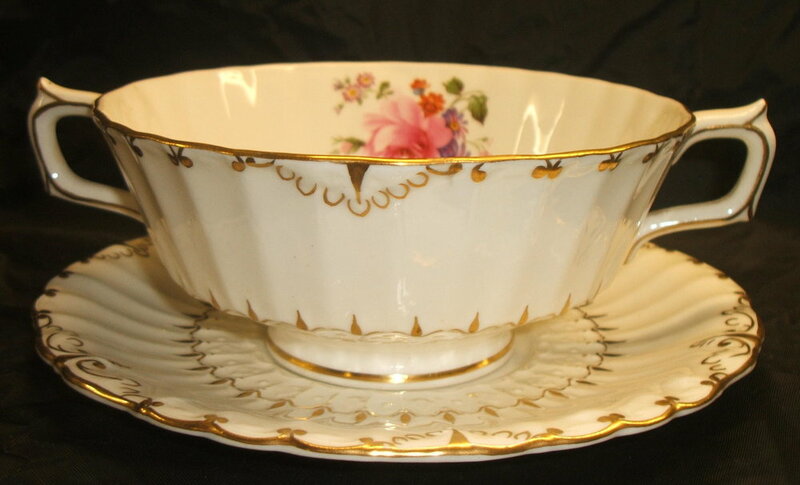 Described as a version of pattern 8687 but with extra gold tracing on the gadroon edge – “Gadroon Rose”. 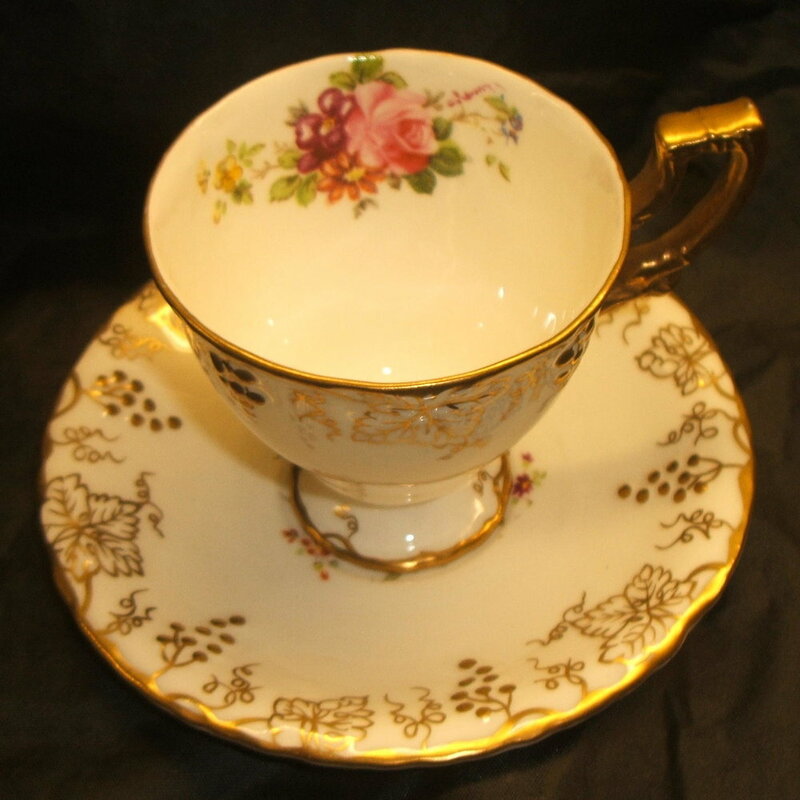 A963 – Teacup and saucer, sugar box and tea cream. “Wentworth” as A941, but on the Burford shape. 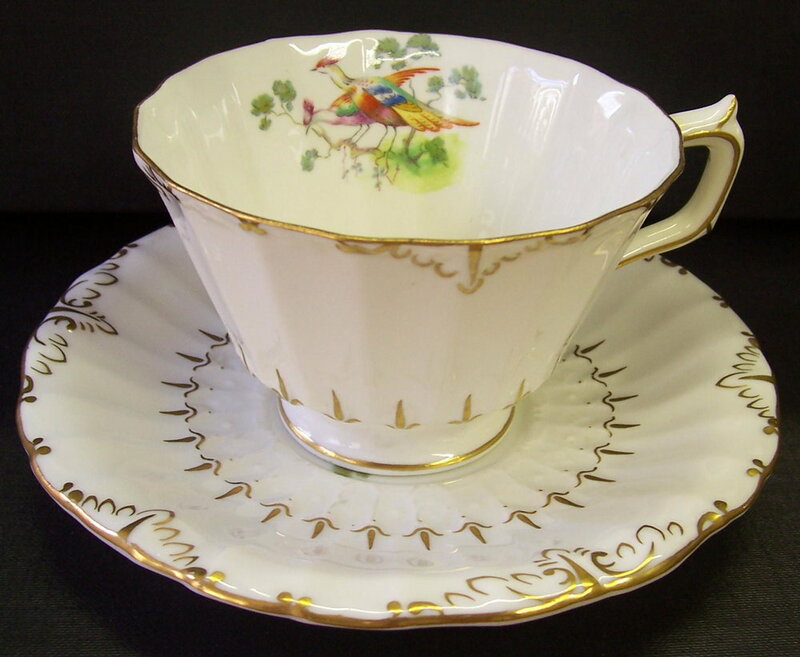 A964 - Burford shape teacup and saucer with hand enamelled bird litho. “Lowestoft”. A964 Variant – Version of Lowestoft in the Burford shape with celadon ground to rim. A965 – Saucer in the Vine shape. As A774 with celadon ground and ivory leaves, but with the addition of a posie litho centre and painted rose. A968 – Gadroon shape soup as A956 but with Montreal green ground. A971 – “Game” by Donald Birbeck. Vine shape with Siam Green ground and ivory leaves. A971 Variant. - A version of “Game” with a cobalt ground. A972 – National and Derbyshire Views by J Price. Vine shape with cobalt ground and ivory leaves. The scenes are printed in brown and then hand coloured. The first seven are signed J Price and have date ciphers for 1946-50. The Monsal Dale Waterfall version dated 1950 is initialled “D.E.K.” and the Haddon Hall plate dated 1959 is signed by Brenda "Pip" Bentley. 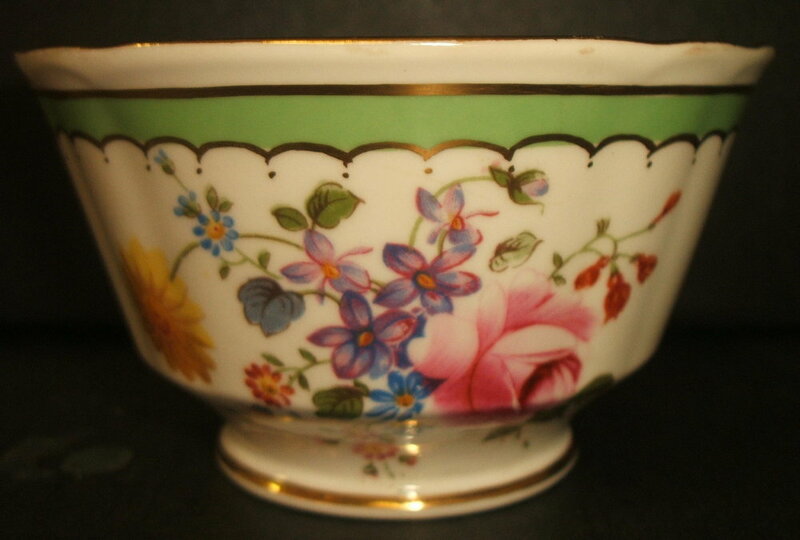 According to Twitchett and Bailey John Price joined Royal Crown Derby from Doulton as decorating Manager in 1945. (See 1947 Staff List). He left the factory in 1949 after which time the enamellers were permitted to sign work as their own. “Cloud Wood House” also seen in this series but is not shown above. A973 – “Shrewsbury” Dessert plate with embossment traced in gold, Litho Ellis sprays in panels in centre. Maroon ground with ivory to leaves. A974 – As A973 but with Cobalt ground. A975 – As A973 but with Montreal green ground. A976 – As A973 but with Salmon ground. A978 – As A973 but with Duesbury Green ground. 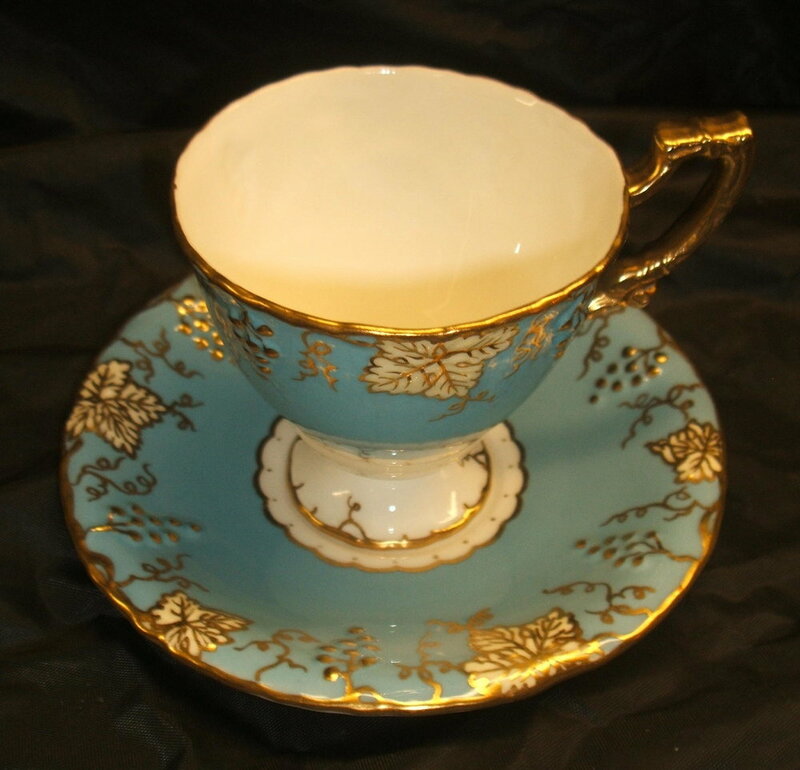 A979 – Dover shape teacup and saucer with blue underglaze ground and litho posie sprays. Hand gilding on blue border. Also found on the Gadroon shape. 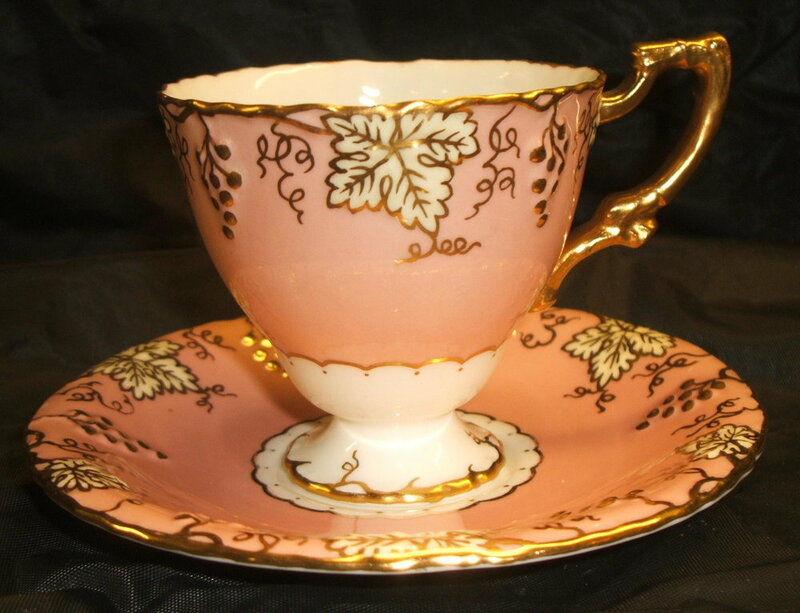 A980 – “Melrose” Chelsea shape teacup and saucer. Litho flower sprays with roses hand enamelled. Blue line and gold edge. A982 – As A810 but cobalt ground to rim and posie centre. 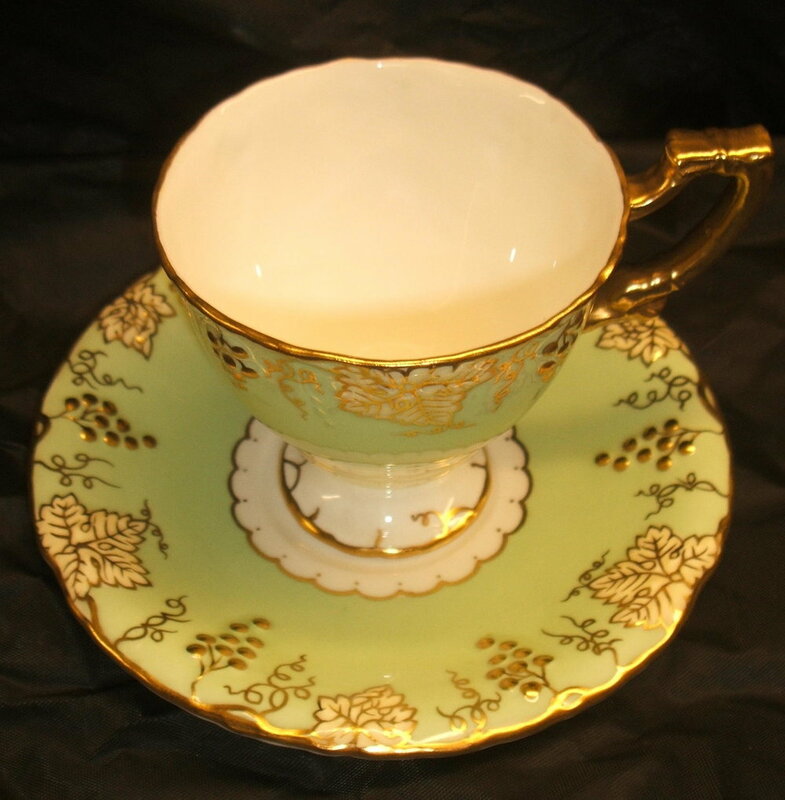 A983 – Surrey shape teacup and saucer with gold traced Duesbury green panels and solid gold handle. A984 – Vine plate with Montreal green ground to rim and ivory leaves. No centre. A985 – “Melody” litho on Bedford shape trays etc. Gold edge. A986 – Vine plate with Ivory leaves and rim depth maroon ground. A987 – Burford shape plate with celadon ground as A819 but Garnett centre instead of Ellis. A988 – Burford shape saucer with Duesbury green ground and Garnett centre. A989 – As A987 but with Salmon ground. A992 – Vine plate with salmon ground to rim, ivory ground to leaves and posie centre. Salmon version of A965.